The TC1200 Tactical kit adds versatility and convenience allowing customers the option to included the 18550 Lithium Ion battery and charging station accessories. The option not only adds convenience but also saves you substantial amount of expense in AAA battery costs long term and gives you a safe place to store your light. 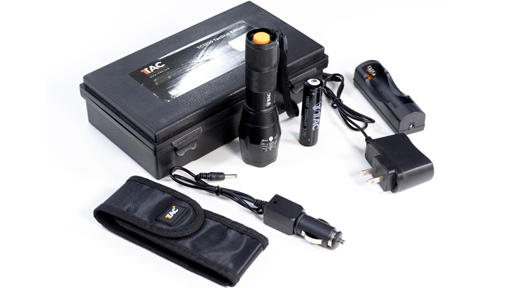 The TC1200 Tactical Kit comes complete with one TC1200 CREE XML-2, 10 Watt, high power flashlight from the most innovative brand in tactical lighting technology. 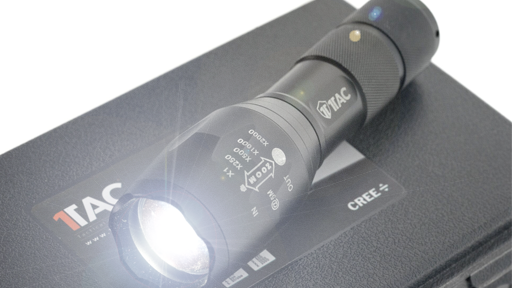 The TC1200 features a solid-state, US made Cree LED XM-L2 LED technology that generates 20 percent more maximum output than the standard XML T6. With up to 1200 lumens of blinding white light focused by a parabolic reflector into a versatile beam with significant reach and ample surround light for maintaining good situational awareness , it is crucial in any situation. 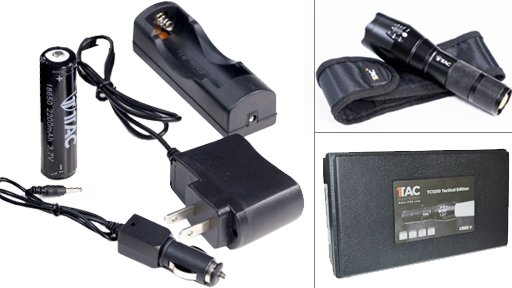 Your Kit also includes one 1Tac 3.7v 18650 Lithium-Ion rechargeable battery, one battery wall charging station, one car charging adapter, one AAA battery holder, one TC1200 holster, one lanyard and one protective high grade storage case. 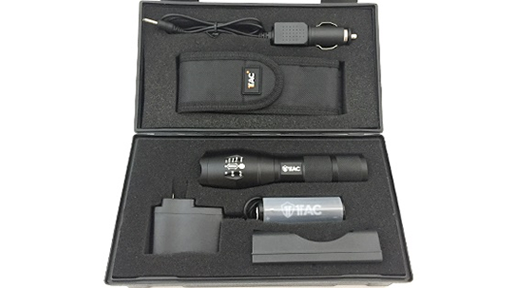 The value of having your TC1200 set up with the Tactical Kit increases your safety with rechargeable batteries to get the most out of your light and the accessories it comes with makes this KIT a must have for any enthusiast. It's an incredible all-around flashlight for every household and vehicle. Aircraft grade Anodized aluminum construction and O-ring seals mean this light is tough and reliable. An IP65 waterproofing standard protects this light against water, while its durable materials protect against drops, impacts, scratches, and corrosion. The blinding strobe and lightly crenelated bezel provide options for self defense, making this an excellent companion for walking home at night, or a solid choice for a back-up light for police or security personnel. The recessed tail switch can be operated with one hand, making this an ideal flashlight for everything from walking your dog, to performing a tactical sweep of a building. Multiple output modes give you the bright outputs needed for outdoor landscapes as well as lower settings that will save you from blinding yourself in closer quarters. By combining the rugged durability and cutting edge design it makes the TC1200 a truly top notch, well-rounded flashlight. At 5 inches long, it's the perfect size for a backpack, glove compartment, or utility drawer.